“Break Up With Him” was written by all five band members; lead singer Matthew Ramsey, multi-instrumentalist Trevor Rosen, drummer Whit Sellers, bassist Geoff Sprung and lead guitarist Brad Tursi, making the first song that the band has written together as a collective group. It is also of note that the Old Dominion band members have other songs on the radio charts currently that they’ve written, including Blake Shelton’s “Sangria,” Tyler Farr’s “A Guy Walks Into A Bar,” and the recent Dierks Bentley hit “Say You Do.” In addition to the hit songs currently/recently on the charts, Old Dominion band members also wrote “Better Dig Two” and “Chainsaw” (The Band Perry), “Come Back To Me” (Keith Urban), “Wake Up Loving You” (Craig Morgan) and “Save It For A Rainy Day” (Kenny Chesney) to name a few. 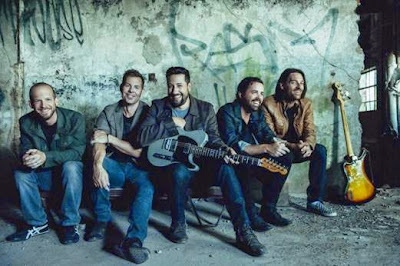 Old Dominion has toured together for over 8 years and show no signs of stopping. Currently, not including solo headlining shows, they’ve joined Kenny Chesney for a run of 18 stadium tour dates on The Big Revival Tour to take the band through August. With the amount of time Old Dominion spends on the road it was no wonder that “Break Up With Him” was penned there as well. With the beginning melody of “Break Up With Him” being laid down one day at a sound check, lyrics coming together in the band’s van and then being finished in a cabin down in Texas, Old Dominion proves they know how to write and perform. Fans can find out more and stay up-to-date on both by visiting Old Dominion’s website, following them on Facebook or Twitter (@OldDominion).